The COP23 Fijian presidency is placing great emphasis on gender equality, human rights and inclusivity in its discus­sions as it prepares to hand over the reins to Poland. In particular, it places great prior­ity in the Gender Action Plan be­cause women are a critical and im­portant part of the solution when it comes to climate change. COP23 Presidency representative Timaima Vakadewabuka made this remark during the Gender Break­fast hosted by Fiji in Bonn, Germa­ny, last Friday. “We have a fundamental belief in leaving no one behind and that is the basis of all our policies in Fiji and everything we pursue in our relations with the world at large,” she said. Meanwhile, speaking at a side event on Saturday Fiji’s chief cli­mate negotiator Ambassador Luke Daunivalu said inclusivity was a critical component in the global cli­mate action programme. 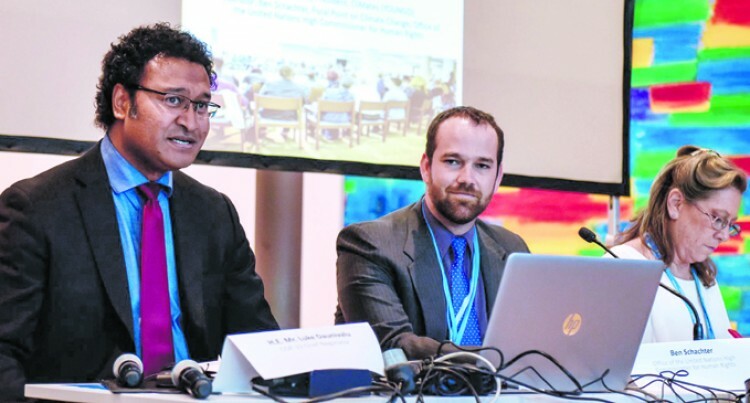 Mr Daunivalu told participants at the side event called Promoting the Human Right to Participation in Climate Action: “The Fijian Presi­dency has stressed from the very start the critical importance of in­clusiveness in the global climate ac­tion programme. “We are all in the same canoe and an effective response to climate change must involve every single person on earth. All ages, all na­tionalities, all backgrounds. Mr Daunivalu highlighted that the Talanoa Dialogue gave everyone a genuine voice in this climate pro­cess because it promoted the hu­man right to participation.